Newspaper Rock: Why are Indian Guides gone? Answer Man: Why are the Indian Guides gone? By Roger SchlueterWhen I was a child growing up in St. Louis in the '60s, my father and I were part of a YMCA-sponsored organization called Indian Guides. 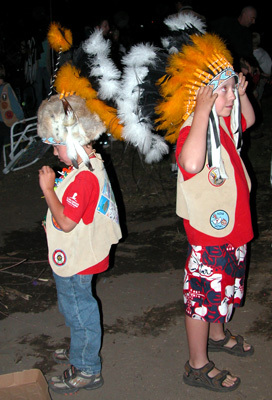 It was similar to the Boy Scouts but with an obvious American Indian influence. We had monthly meetings, camping trips, and many activities that were centered on American Indian cultures. It was great fun and instilled in me a lifelong interest and respect for Native Americans. My question is this: What happened to this organization? Do you have any history on it? Was it a victim of political correctness? -- WNC, of CollinsvilleSchlueter's answer, in part:Like you, it seems a shame to me to change a program originally set up to promote the best of Indian life to other peoples. I was thinking it would be kind of like me, of German heritage, asking various churches and granges to start using the term "pork sausage dinner" instead of "wurstmarkt," which may denote an afternoon of beer and fried, fatty meat to some rather than Old World tradition. But I have no Indian blood nor do I know to what extremes some of those YMCA tribes might have gone, so I can't speak definitively. In any case, the Y's Adventure Guides program still involves a quarter-million children and parents annually.My response: The Y-Indian Guides never promoted "the best of Indian life." It promoted a stereotypical, one-dimensional view of Indians as primitive chiefs, braves, and wampum-keepers. It ignored the wide diversity of thousands of Native cultures, not to mention the Indians' continued existence as modern-day people who don't dress in feathers and leathers. For more on the subject, see YMCA-Indian Guides.